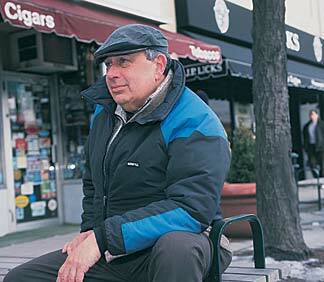 STREET SMART: Alan Lupo 59, meeting us for lunch in Brookline but still a Winthrop guy. The first thing that impresses you about Alan Lupo 59 is his ability to recall details from four decades ago  the clothes his friends wore, where they grew up, even where their parents emigrated from. Over lunch at Zaftigs deli in Brookline with a visitor from Amherst, Lupo weaves vivid memories into funny, touching, and captivating stories. Noshing on chicken salad on marbled rye, he becomes again the Jewish kid from Winthrop spending three beautiful years in the Alpha Epsilon Pi house on Sunset Avenue, cavorting with pledge-class brothers Irv Labovitz and Milty Lebowitz. close-knit community, and the authors own humorous and proletarian take on life. Jewish American Literature: A Norton Anthology, edited by Professor Emeritus JULES CHAMETZKY, John Felstiner, Hilene Flanzbaum, and Kathryn Hellerstein; W.W. Norton, New York. A hefty anthology of prose, poetry, essays, comedy, music, letters, and diaries from 145 writers spanning almost 350 years, this collection addresses the complexity of being both Jewish and American. The Port of Gloucester by JOSH REYNOLDS 93; Commonwealth Editions, Beverly. This portfolio of 45 color photographs, many made during the former Collegian photographers stint with the Gloucester Daily Times, explores life in the nations oldest fishing port, a working waterfront pressured by a declining fishery and by tourism and development. Land of the Commonwealth, photographs by Richard Cheek, foreword by JOHN UPDIKE 93H; UMass Press, Amherst. If our long-settled and populous state is yet so liveable, writes Updike, much credit is due a group of citizens dedicated for a century to the acquisition of bits of scenery as country parks for the growing and crowded masses of greater Boston. Acquisitions by the Trustees of Reservations from the Berkshires to Marthas Vineyard are showcased in this handsome collection.